A Happy Christmas to everyone – God bless us, every one! Author Steve WilliamsonPosted on December 20, 2018 December 12, 2018 1 Comment on Christmas greetings. Just a reminder that the sun does shine! Often strong sunlight makes for entrancing shadows, and this picture is really all about the shadows cast across the pavement of the Row. For those of you who don’t know Chester, the Rows are walkways, sitting on top of the ground level shops, that have other shops opening on to them – highly convenient in wet weather but also useful places to sketch and paint in summer time too. The sun is shining almost directly into the Row, and it’s the “almost” that makes the shadows attract the eye. We have busy diagonals, the row edges and the shadows crossing each other again and again, all adding up to an active painting. 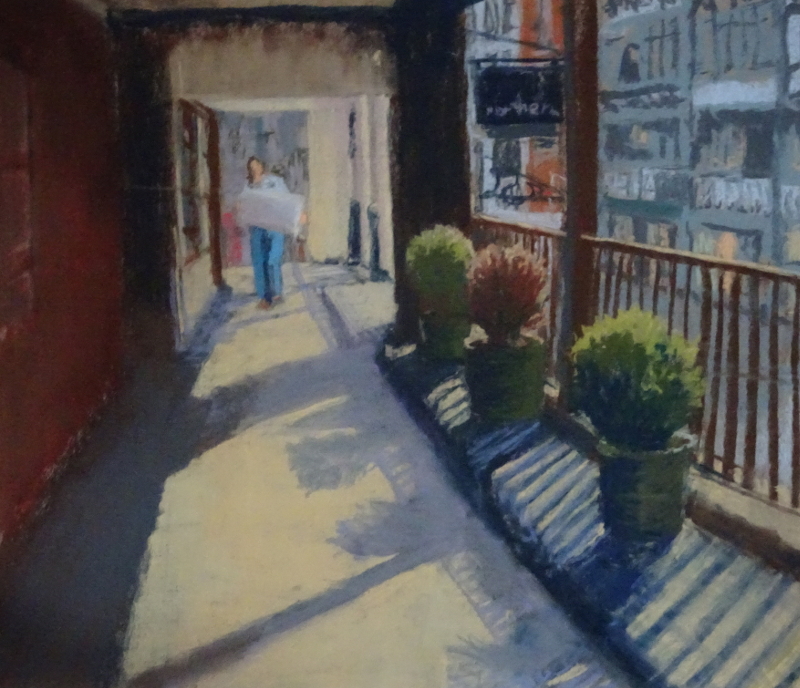 Looking through the open side of the row, you can see the other side of the street, shaded and painted in undemanding colour. Most of the area within the Row is painted in dark tones, so the brightest tones are the girl’s trousers and the tops of the bushes. It is the strong contrasts of tone highlighted with a few splashes of bright colour that tell you it’s a hot day. Though the foot path is actually grey, but by playing up the sunlight using cream and creating the shadows on it in a complementary mauve, I have made the day even hotter. Memories are made of this! 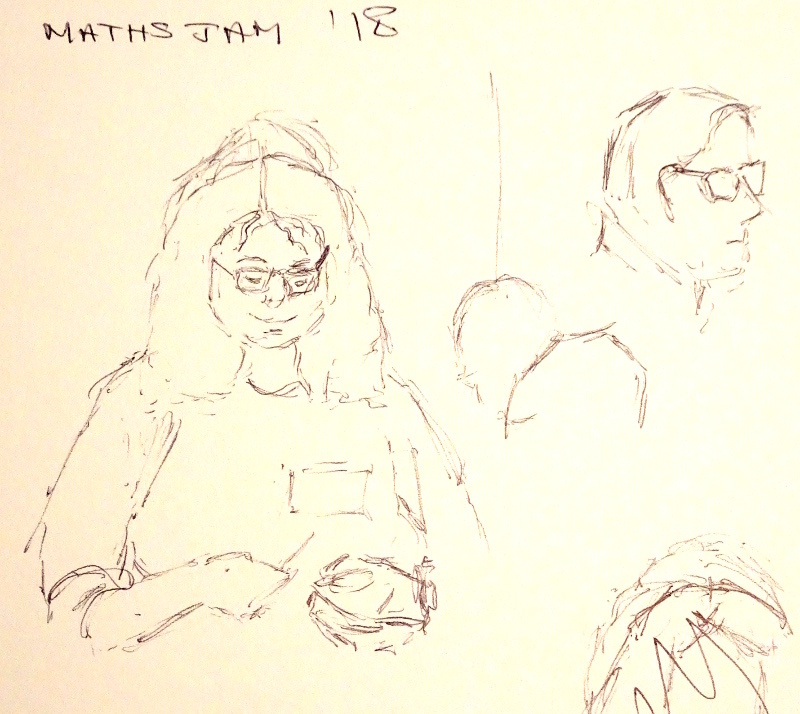 I attended MathsJam 2018 (mathsjam.com/gathering/) recently and thoroughly enjoyed the event – my companions were friendly and inclusive and the talks were fascinating, entertaining, puzzling (there were a lot of puzzles!) though many, even the entertaining ones, were beyond me. I gather that nobody at the event understands all the talks! 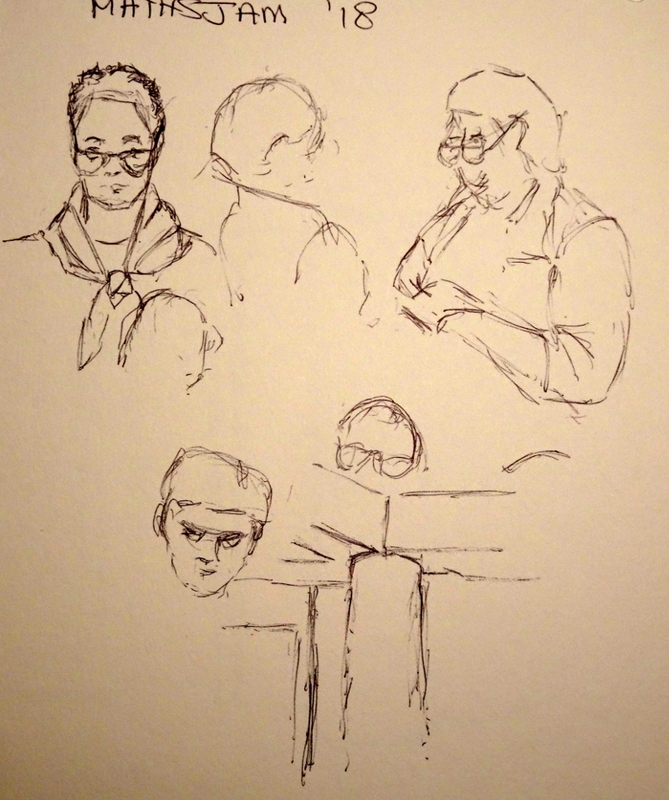 It had seemed a good opportunity to try sketching “in public”, an extension of my efforts to improve my drawing skills. In fact,I did not spend much time at it but was quite pleased at the results. 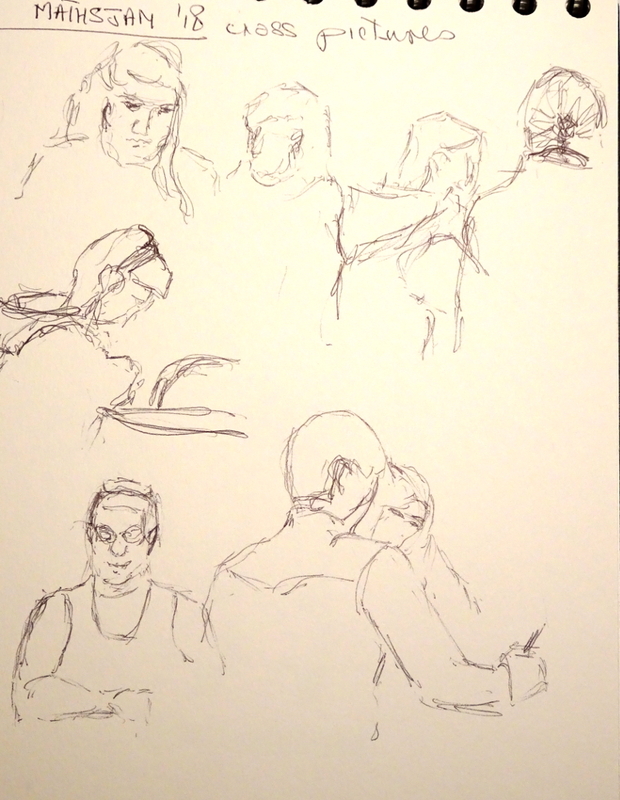 People move, of course,and images are jumbled. 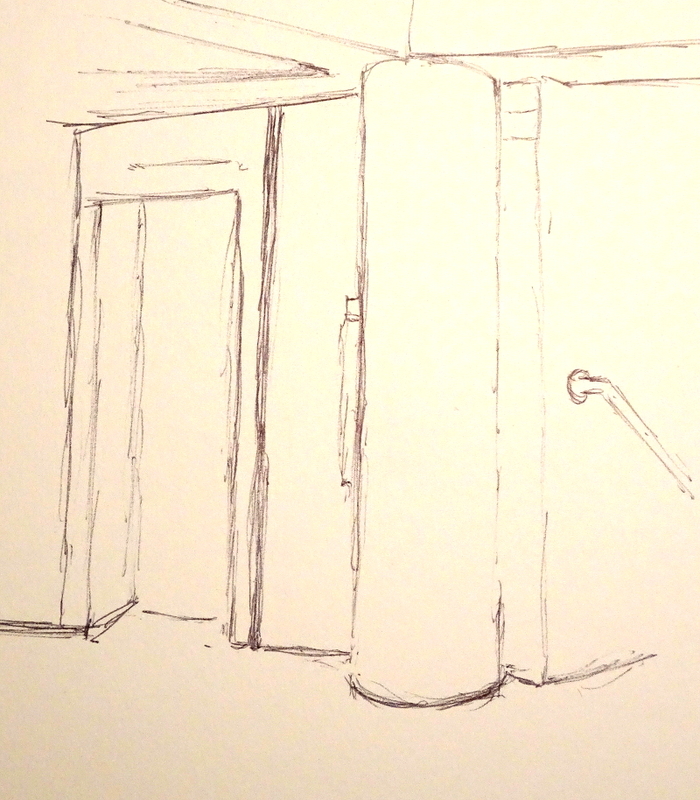 I became interested in the lines and angles of corridors, pillars and stairs.